Brace yourselves #WyntrIsComing but beware, she isn’t playing any games and she has most certainly slayed that throne. Meet Mileena Wyntr, the alter ego of a WSA student who puts even Sasha Fierce to shame! 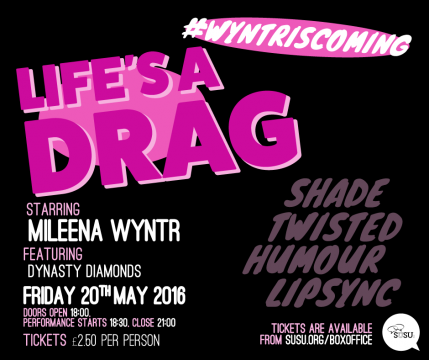 Armed with an acid tongue to throw shade on even the sassiest amongst you, Wyntr will be gracing the WSA Cafe for her first ever drag show on Friday 20th May. Doors open at 18:00 with the performance starting at 18:30. Expect lip sync, comedy and dance routines, complete with special guest Dynasty Diamonds. Tickets are £2.50 per person available from our Box Office.